“Ippei had everything,” Mishima explains. Although intellectually successful and happily married to a beautiful woman, Ippei was prone to infidelity, which instilled in Koji a dangerous blend of jealousy and disapproval. Ippei “made use of the youth of others without reserve, greedily sucking on Koji, dog-like, until the very marrow of the bones had gone.” Koji’s frustrations rise and, with Yuko in tow, they confront Ippei during a tryst. Things turn violent; the episode results in a seriously-wounded Ippei going to the hospital and Koji going to prison for two years. Later, when Koji leaves prison, Yuko insists that he be released into her care. He travels to the “archetypal fishing village” where Yuko and the recovering Ippei live, and plans to work for them in their greenhouse. Although Koji repeats that he has “repented” and is a “different person now,” memories of past lust and violence return, despite any atonement. Mishima’s timelines jump around and provide unnecessary distraction to an otherwise straightforward story. The novel opens with an ominous vision of the side-by-side graves of Ippei, Yuko, and Koji, and proceeds to recount events that happened before and after Koji went to prison. While these carefully plotted flashbacks produce suspense by relying on the mystery of whatever information has yet to be revealed by the author, it feels as if the novel would flow better with a more traditional arc. Despite Mishima’s questionable plotting, there are beautiful moments interspersed throughout the novel that focus on minutiae and how everyday, practically unnoticeable moments have the potential to impact a person’s life. While unfurling the various twists of his melodrama, Mishima manages to sneak in short, poetic asides about free will, materiality, and fate. 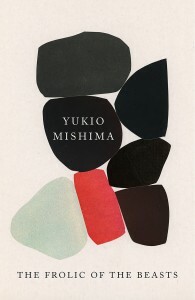 In one scene, Koji notices a black wrench on the ground and “the moment was imbued with a quiet inexplicable enchantment; time stood still and almost burst with the fascination of the wrench.” “Time was like a basket of fruit,” Mishima explains, leaving readers to ponder its koan-like subtext. Although working with timeless themes and classical archetypes, Mishima manages to find a modern psychological resonance in their actions. In The Frolic of the Beasts, he proves that a contemporary thinker can both reconsider and revitalize the past. Originally published in 1961 and only now being translated, this novel, modeled after a 14th C No play, finds modern intrigue in an archetypal tale.